Having short fingernails is like a complete playground for beautiful loud polish and extreme nail art. I found this design on a Nails Mag Blog and could not resist trying it out. 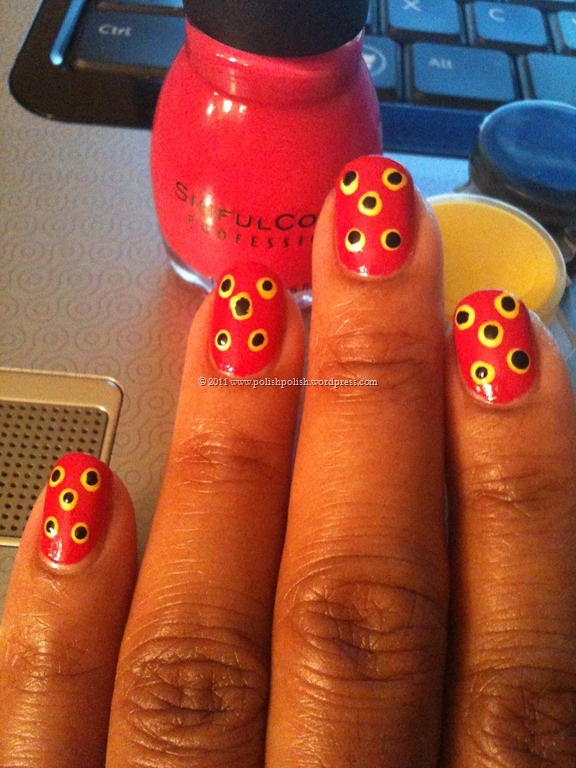 Sinful Colors “Feeling Great” was the perfect base for the yellow-trimmed black dots of acrylic paint. The most difficult part of this nail art design is making sure you don’t paint the base color (Feeling Great) “outside the lines” of your cuticle! The dots are child’s play. I’m still having so much fun….. I bought some new art brushes and some metallic paint today. All I need now is some willing participants to let me play on their nail beds…… and, some free time. This entry was posted in Sinful Colors and tagged acrylic paint, dotting tool, feeling great, nail art, polka dots, short nails.